Anything that contains 95 pounds of fondant has got to be fabulous. The Claremont Hotel & Spa will unveil a gigantic gingerbread house as part of its tree-lighting ceremony and holiday open house, from 4:30 to 7 p.m. today. Part of an annual tradition, the house has been under construction for the past week or so. Chef Josh Thomsen helmed the project, partnering with California Culinary Academy students to create a sweet replica of the historic hotel. Previous years' versions have stood over ten feet tall; this year's house "is going to look completely different than last year's," Thomsen said. It will be more detailed, because "more time and effort has gone into the little features like window treatments and the roof, as well as the entrance to the hotel." The Claremont's pastry sous-chef Janine Fong and her staff baked enormous planks of gingerbread and prepared the rest of the house's construction materials. Overall, they used 200 pounds of flour, 250 pounds of molasses, 125 pounds of powdered sugar, 95 pounds of fondant, six pounds of graham crackers, and two pounds of powdered ginger. Another 28 pounds of assorted candies — including Jelly Bellies, peppermints, red vines, candied almonds, and Peeps — have been affixed to the house as well, Thomsen said. "Gingerbread houses are synonymous with the holidays, and it's such a special tradition at the Claremont. 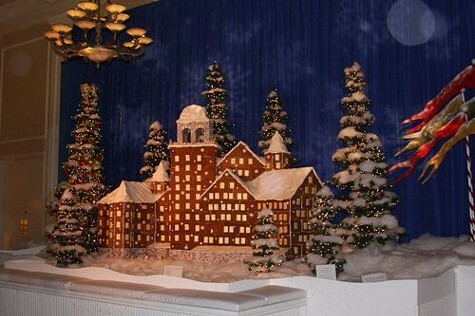 My own favorite gingerbread-house memories are actually from being here — kids, families, and guests are just in awe of this giant replica of the hotel." The house will remain on display in the hotel's lobby until two weeks after Christmas. Does its deconstruction crew get to feast on it? Nope, Thomsen said. "Because of the length of time it's up, we have to treat it. The house is definitely not edible." This evening's even also includes carolers, hot cider, a reading of 'Twas the Night Before Christmas, and a rare pre-holiday appearance by someone strongly resembling Santa Claus.